The investment in Swakop Uranium not only marked the biggest in Namibia since the country’s independence but also by far the single biggest investment by China in Africa. | Note: The cover image is not the part of the original publication. Recent scholarship in political ecology has called for investigating how resources are discursively and materially securitized within political economies (Peluso and Vandergeest 2011). Uranium is a quintessential hybrid human/non-human resource whose securitization has historically been a high global priority. As the 51st-most abundant element in the Earth’s crust (tied with tin), uranium is approximately 40 times more abundant than silver. It is widely distributed, albeit typically at very low concentrations. Its distinctiveness lies not in its rarity but instead in the key physical property – radioactivity – that endows it with social life. Its radioactivity is in turn given meaning through the social construction of what Hecht (2009) refers to as “nuclearity,” or the “apparently immutable ontology [that] has long distinguished nuclear things from non-nuclear things” (Hecht 2009:897). Uranium’s intertwined material properties and social meaning have made it one of the world’s most important commodities in war and security. Today, that importance is being extended through its role in climate change mitigation via the intensified use of nuclear power in China and beyond. The distribution of the benefits and costs of this production, however, has shifted significantly since the dawn of the nuclear age in 1945. While global South countries such as Namibia, the Democratic Republic of the Congo, and Niger have exported uranium for decades, Cold War uranium extraction was concentrated in Western countries such as the United States, Canada, and Australia, and Soviet states such as Kazakhstan and Russia until the 1970s. The United States was the world’s largest uranium producer from 1953 to 1980, with its peak production occurring in 1960 (Finch et al. 1973). Like the role played by nature-exporting states in the development of capitalism (Coronil 1997), uranium-exporting states in the global South were essential to the development of nuclear technologies but were deemed fundamentally separate from the nuclear geopolitics in which Cold War powers were engaged (Hecht 2012). Per this logic, Namibia was a producer of uranium, but it was not a nuclear state. energy generation (Conde and Kallis 2012; Hecht 2012). At the end of the Cold War, the United States responded to these concerns by passing the 1990 Radiation Exposure Compensation Act, which required awarding US$ 100,000 to uranium miners diagnosed with cancer or respiratory disorders. Australia responded to similar criticisms by implementing a nearly 25-year ban on new uranium mines that was only recently lifted. With domestic production declining, former major producers such as the United States began to implement the import-dependent sourcing model long used by former colonial powers such as France. These transitions effectively transferred the burden of uranium production from the global North, where most uranium is used, to the global South, where safety and environmental regulations are less constraining. This process continues today. Despite this new sourcing model, though, the separation between nuclear and non-nuclear countries identified by Hecht (2009) remained in place. As late as 1995, the United States did not consider Namibia to be relevant to discussions of energy security, even though it produced nearly 10 percent of global uranium that year (MME 2010). Uranium geopolitics shifted again on 11 September 2001, as Western governments became increasingly concerned with the possibility of terrorist groups and “rogue” states acquiring nuclear fuel. Despite pressures to reduce Western reliance on strategic foreign resources in the early 2000s, officials in the United States and Australia prioritized securing global South uranium sources over accepting the risks of re-intensified domestic extraction. The push to secure global South uranium sources did not, however, increase the relative power of exporting states. Without an OPEC-like cartel, uranium-exporting countries have instead been subjected to growing surveillance and intervention by uranium importers. The 2003 Niger yellowcake scare ushered in a new era of US intervention to secure uranium networks (Hecht 2012). In Namibia, this included stationing semipermanent US security officials at the Rössing uranium mine, in which the Iranian government owns a 15 percent stake after a uranium theft was reported. As over 30 percent of Rössing’s uranium is destined for US markets, its Rio Tinto owners had little choice but to comply. Uranium geopolitics are shifting yet again today with three interconnected developments: China’s increasing global influence, its rising domestic living standards, and its industrialization-fuelled environmental challenges (Power, Mohan, and Tan-Mullins 2012). Coal supplies 73 percent of China’s domestic energy demand (WNA 2017). In response to growing domestic concerns over pollution and carbon emissions, China’s leadership has prioritized reducing energy-related pollution in recent years and aims to reduce 2020 carbon emissions by 40 to 45 percent from 2005 levels (Financial Times 2016). Uranium’s “clean energy” potential makes it essential to China’s continued pursuit of industrialization and improved living conditions for its population without worsening air pollution. Furthermore, nuclear energy supports China’s rebranding as a global energy leader, supporting its geopolitical status as a rising world leader. Nuclear and renewable energy sources are now expected to provide 95 percent of the 420 Gigawatt electrical (GWe) of generation capacity that China will add by 2020 (WNA 2017). Construction of at least 21 additional nuclear power facilities will increase China’s nuclear power capacity from 31 GWe in 2016 to an anticipated 150 GWe by 2030 and 400 to 500 GWe by 2050 (WNA 2017). It aims to have 110 reactors in operation by 2030, compared to 37 today (Larmer 2017). The associated increase in China’s uranium needs is anticipated to make it the world’s second-largest uranium consumer after the United States by 2020 (Anonymous 2 2015). 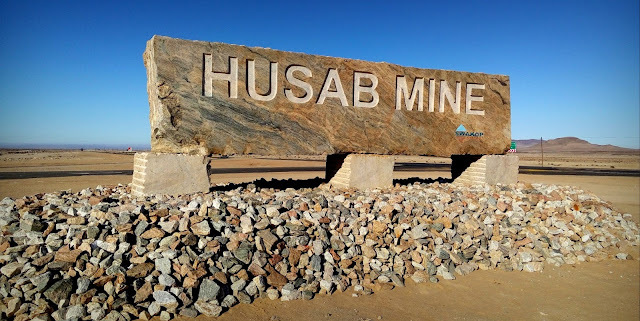 Map Attribute: Husab Uranium Mine/ GPS Coordinate: -22.58807,15.0003829, Altitude: 6025m / Source: (c) 2018 DigitalGlobe via Google Earth | Note: The map is not the part of the original publication. The implications of this shift in uranium geopolitics may extend beyond Namibia, where China began to challenge the historical dominance of South African, British, American, Australian, French, Japanese, and Canadian interests in Namibian uranium mining in the first decade of the twenty-first century. China’s rise as a nuclear energy power may even challenge the nuclear/non-nuclear binary described by Hecht (2009). In April 2017, Swakop Uranium, the China–Namibia partnership that owns the Husab mine, submitted initial plans to Namibia’s Ministry of Mines and Energy for a nuclear power plant in Namibia (Kaira 2017). Current Namibian president Hage Geingob first expressed interest in such a plan in 2014 when he toured China’s Dayawan Nuclear Power Plant, which is managed by Swakop Uranium’s parent company, CGNPC. If a Namibian nuclear power plant is approved, it would become only the second nuclear energy power station in Africa after South Africa’s Koeberg Nuclear Power Station, which was commissioned in 1984. Like China, African countries face rapidly escalating demands from their populations for energy provision. While future population pressures will play a larger role in increasing demand in Africa than in China, African countries and China face a similar need to increase living standards and support industrialization without aggravating air pollution and climate change problems. Namibia’s relative stability and uranium resources make it well suited for Africa’s second power plant, but it may not be the only African nuclear power plant proposed in partnership with the Chinese government. If further plans emerge and are implemented, China’s rise as a nuclear energy power could challenge the power differential that has long separated African uranium exporters from the nuclear powers of the world. Meredith J. DeBoom is currently a Ph.D. candidate in the Department of Geography and the Institute of Behavioral Science at the University of Colorado at Boulder. Beginning in Fall 2018, she will be an assistant professor of Geography at the University of South Carolina. Her research analyses the politics of natural resource extraction and development in southern Africa. She is particularly interested in how Africans are engaging with extractive frontiers, such as marine mining, and in geopolitical transitions, including China’s rising influence. DeBoom, Meredith J. (2017), Nuclear (Geo)Political Ecologies: A Hybrid Geography of Chinese Investment in Namibia’s Uranium Sector, in: Journal of Current Chinese Affairs, 46, 3, 62–65. Peluso, Nancy, and Peter Vandergeest (2011), Taking the Jungle Out of the Forest: Counter-Insurgency and the Making of National Natures, in: Richard Peet, Paul Robbins and Michael Watts (eds), Global Political Ecology, New York, NY: Routledge, 252–284. Hecht, Gabrielle (2009), Africa and the Nuclear World: Labor, Occupational Health, and the Transnational Production of Uranium, in: Comparative Studies in Society and History, 51, 4, 896–926. Finch, Warren, Arthur Butler, Frank Armstrong, Albert Weissenborn, and H. Staatz Mortimer (1973), Nuclear Fuels, in: Geological Survey Professional Paper No. 820, Washington, DC: U.S. Department of the Interior. Coronil, Fernando (1997), The Magical State: Nature, Money, and Modernity in Venezuela, Chicago, IL: University of Chicago Press. Hecht, Gabrielle (2012), Being Nuclear: Africans and the Global Uranium Trade, Cambridge, MA: MIT Press. Conde, Marta, and Giorgos Kallis (2012), The Global Uranium Rush and Its Africa Frontier: Effects, Reactions and Social Movements in Namibia, in: Global Environmental Change, 22, 3, 596610. Ministry of Mines and Energy (2010), Strategic Environmental Assessment for the Central Namib, Windhoek: Government of the Republic of Namibia. Power, Marcus, Giles Mohan, and May Tan-Mullins (2012), China’s Resource Diplomacy in Africa: Powering Development?, New York, NY: Palgrave MacMillan. Financial Times (2016), Uranium Prices Hit 11-Year Low, 20 July, online: (6 January 2017). Larmer, Brook (2017), Is China the World’s New Colonial Power?, in: The New York Times Magazine, 2 May, online: (2 October 2017). Anonymous 2 (2015), interview, Chinese government representative, Windhoek, Namibia, 15 November. Kaira, Chamwe (2017), Chinese Propose Nuclear Plant, in: The Windhoek Observer, 28 April, online: (2 October 2017).